Born in the Czech Republic (formerly Czechoslovakia), Petr began his career with the youth team at Motorlet in Prague, before joining Slavia Praha where he won several Under 19 caps for his country. In June 2003, he joined Czech side Viktoria Zizkov where he scored 13 goals in his first season, and represented his country at Under 20 and under 21 level. He joined West Ham United in July 2005 at the age of 20 and scored three times during pre-season games. After signing a one year deal, he failed to make a first team appearance during his stay at Upton Park. He went on loan to Northampton Town in September 2005, but injury meant he only made three appearances. 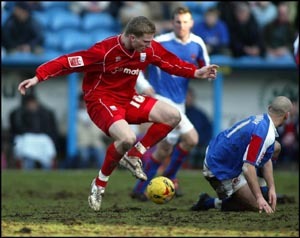 Another loan was arranged in November 2005, this time to Swindon Town where he played five games before returning after a single month. Petr third loan spell was with Diamonds, where he arrived for an end of season loan on 27 January 2006. He will be remembered by many Diamonds fans for the spectacular goal he scored against Notts County in February 2006, arguably one of the best seen at Nene Park. After his returned to the Hammers, he was released and returned to the Czech republic where he played for FK Mlada Boleslav. Petr had to retire from the game at a young age of 22 in June 2007 due to ill health after a kidney problem and a heart condition was diagnosed. He has since recovered sufficiently to completing a coaching coarse and is currently involved in coaching children.